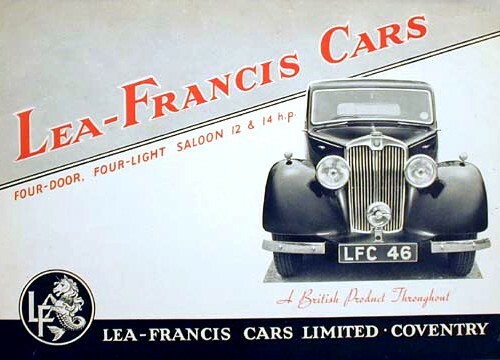 Lea-Francis 12 and 14 HP models of 1946 are similar in principle to the pre-war cars but considerably modified in detail. In addition to the four-light Saloon there is a Utility/estate car. 12 and 14 has 100-mm stroke and 69- and 75-mm bore respectively, giving 1496- and 1767-cc cubic capacity. Both are OHV Fours with two high-positioned camshafts and hemi-spherical combustion chambers. Chassis is underslung at the rear and has 9 ft 3 in wheelbase and 5.50-17 tyres. Suspension is conventional with rigid axles and semi-elliptic leaf springs front and rear. Brakes are Girling mechanical.